(1) We have finished cleaning up the thumbnails in the Breast-nonmalignant chapter. We have also removed the bad links, including those from PathConsult, a "clinical decision support tool" from Elsevier, that now appears to be discontinued. We are also working on replacing the thumbnails in other chapters. (2) Below the heading of each of the topics in our textbook, we are going to be adding a link to the PubMed page that shows the search results of articles relevant to that topic. Click here to see how this will look and let us know what you think. A 45 year old man had a 2 month history of a rapidly enlarging, painless testicular swelling. 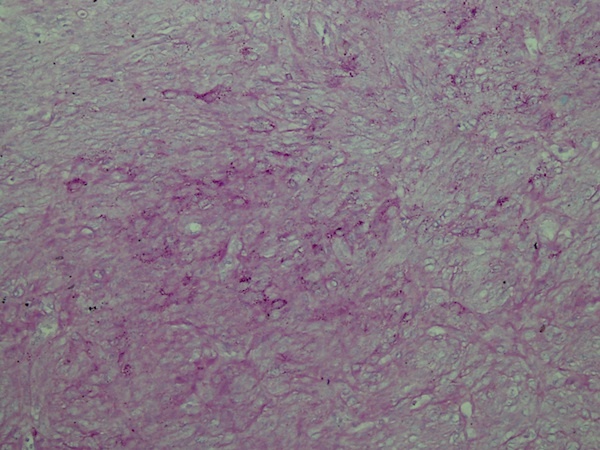 The clinical impression was a neoplastic lesion, such as seminoma. 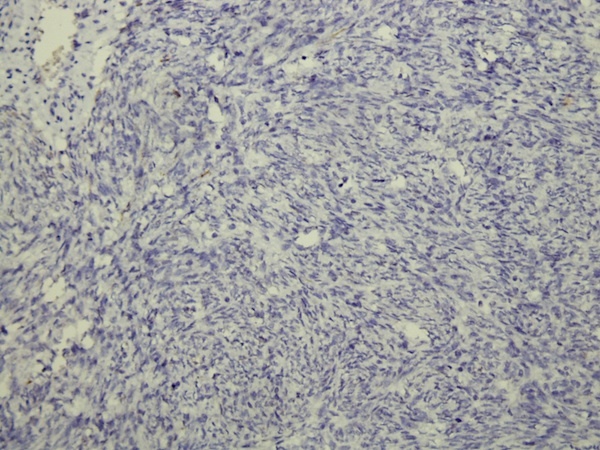 The behavior of leiomyosarcoma is site related. 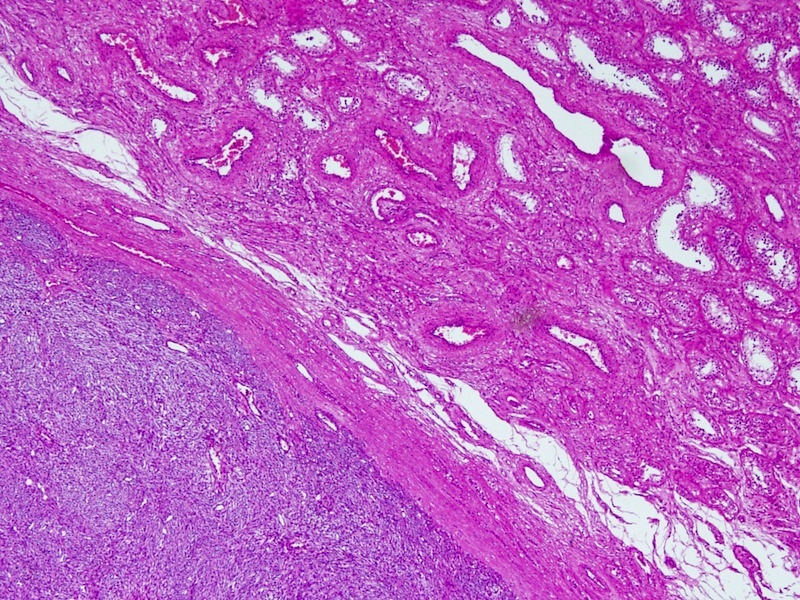 Paratesticular leiomyosarcomas are rare, and usually low-grade (Am J Surg Pathol 2001;25:1143). The mean patient age is 62 years (range 34-86 years), and most cases involve the testicular tunica or spermatic cord. The mean size is 5 cm (range 2-9 cm). 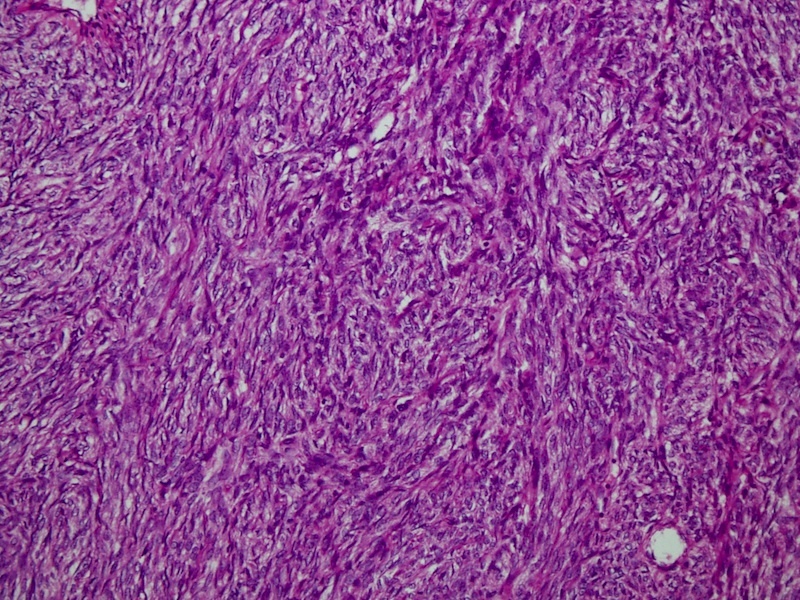 Tumors have fascicular growth of a spindle cell component resembling leiomyosarcoma at other sites, with nuclear pleomorphism, mitotic activity and coagulative necrosis. 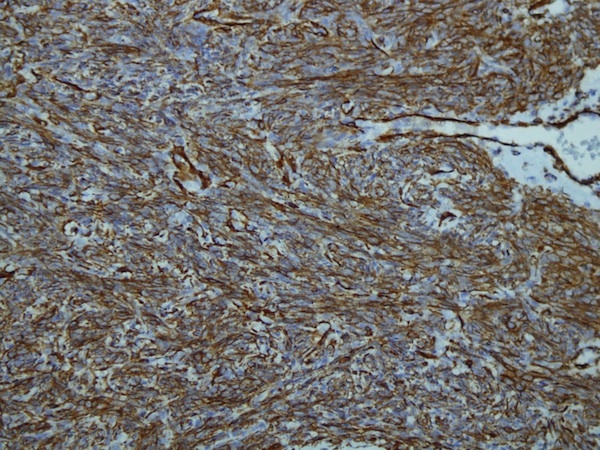 Most tumors are immunoreactive for muscle specific actin, smooth muscle actin and desmin, and a third are CD34+. 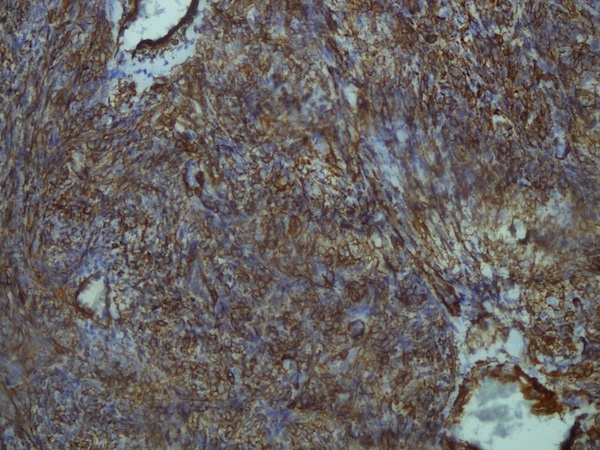 Focal staining may also be seen for cytokeratin. 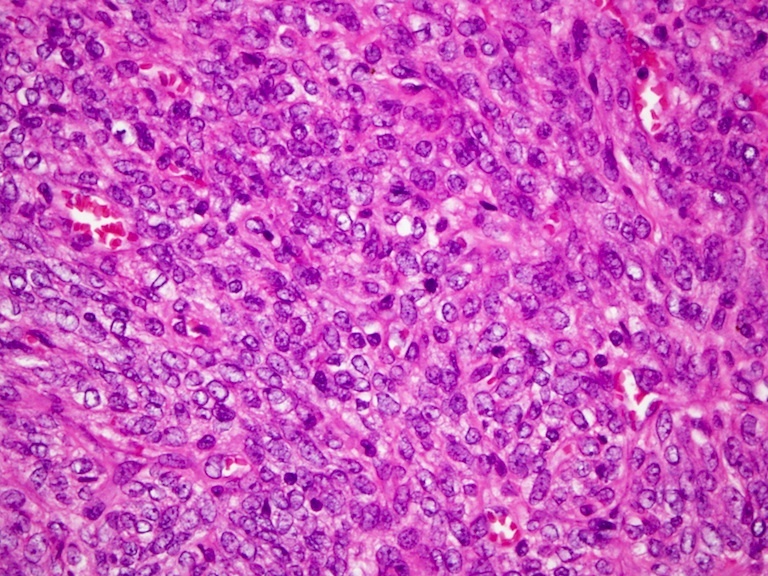 The differential diagnosis includes variants of leiomyoma, also rare, which may be cellular or hemorrhagic, or have mitotic activity, bizarre nuclei, epithelioid features or myxoid stroma. Radical orchiectomy / high inguinal orchiectomy followed by surveillance or radiation or chemotherapy appears to be the treatment of choice. 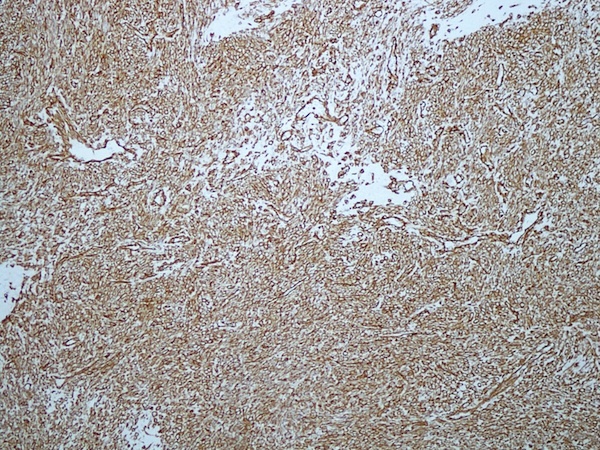 High grade tumors are aggressive, and may metastasize to lymph nodes, liver or lungs, and cause death (Med Trop (Mars) 2002;62:531). Those with low grade disease occasionally have recurrences, but no deaths.